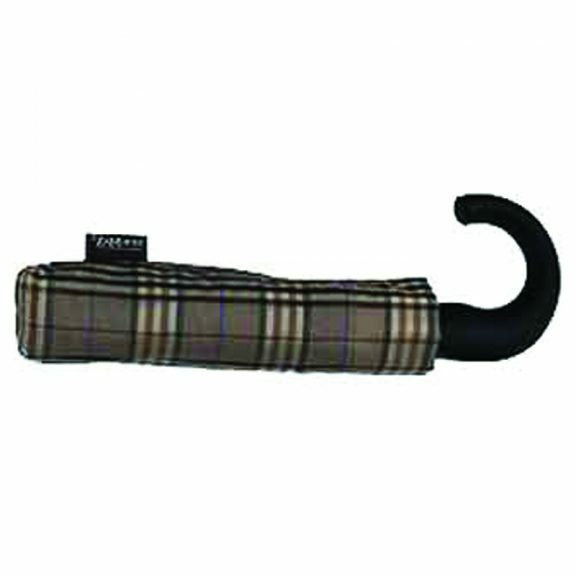 The York – Curved Handle Gents Auto Open & Close Compact Umbrella. This is a smart gent’s push button, auto-open & close, folding umbrella. You simply push the button on the rather funky curved handle and the automatic mechanism extends the shaft and opens the canopy. When / if the rain stops, press the button again to close the canopy. You then just compress the shaft to reload it ready for use. Good quality, strong travel umbrella. 24 cm long (closed). 90 cm canopy span.